Use just 3 or 4 ingredients. 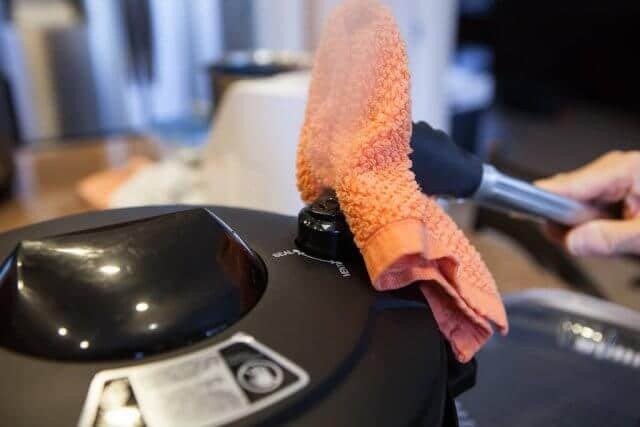 How to simmer on stovetop or use pressure cooker. 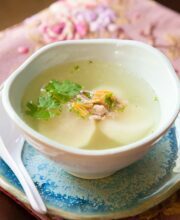 Chinese soups can be heavy, filling and fiery, such as Chinese Hot & Sour Soup, or light, clean and cleansing, like this Chinese Daikon Soup. These kinds of everyday soups are simple to make, require just a handful of ingredients (in this case, four ingredients – actually, three, if you don’t want to use cilantro) and so good for you. There are 2 essential ingredients to this soup: daikon and pork. 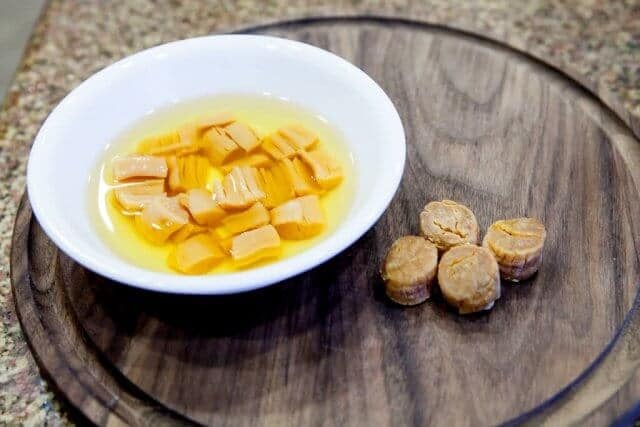 An optional ingredient is dried scallops (we’ll talk more about that later) and garnish with fresh cilantro. At times, I like to also add carrots to the soup. 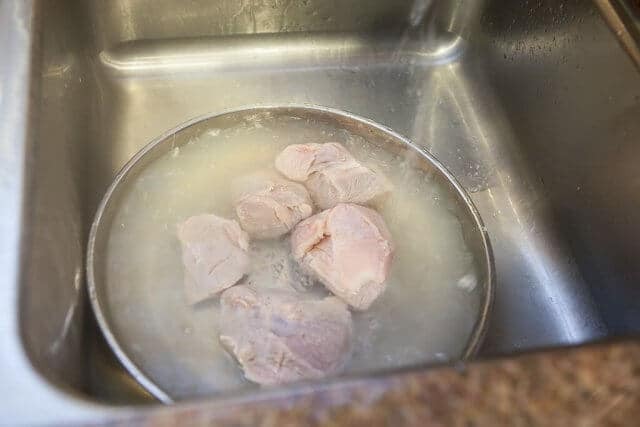 Have you ever made meat or bone broth and seen white or grayish foam forming on top of the water? What is it? Well, it’s a combination of surface protein, dirt, minuscule bone fragments, fats, etc. All that stuff can make your broth cloudy and gritty. 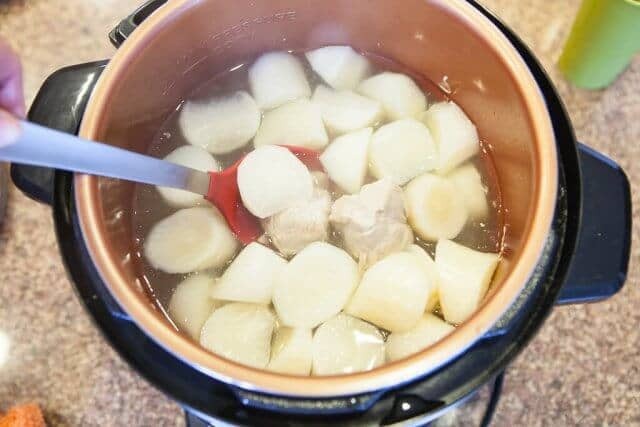 For the best broth made from meat and/or bones, the raw meat must first be parboiled for a few minutes in order to remove all that “gunk.” I do this by bringing a large pot of water to a boil, then adding the bones/meat to the water and return to a hard, rolling boil for about 5-7 minutes. The rollicking, harsh boiling water will give the meat a good wash and scrub, releasing particles, solidifying protein, loosening and bits that don’t belong in my clear broth. Then, I’ll drain the dirty water, give the meat or bones a rinse and start the broth afresh with clean water in the pot. While all this does take an extra 15 minutes of your time, it’s absolutely worth the effort. There’s a shortcut to this, especially if you’re only using chunks of meat to make the broth. 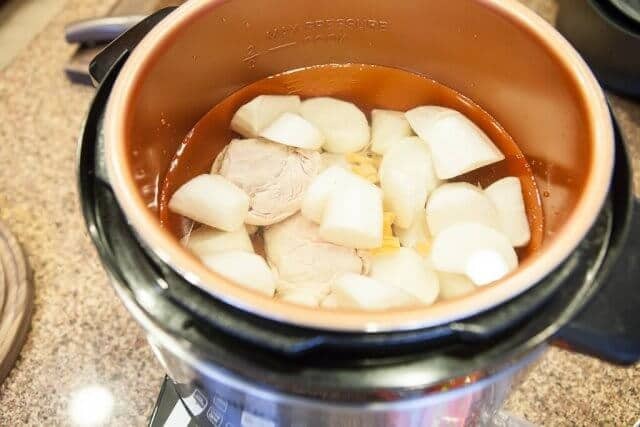 We buy pork roasts when they are on sale, then cut them up into smaller-than-fist sized chunks to freeze and make soups. This shortcut shaves the parboiling time down from 15 minutes to just 3 minutes. Bring a quart of water to a boil. My Mom has an electric hot water kettle. At my house, I just use the hot water directly from my instant hot water dispenser (which I can’t live without!). 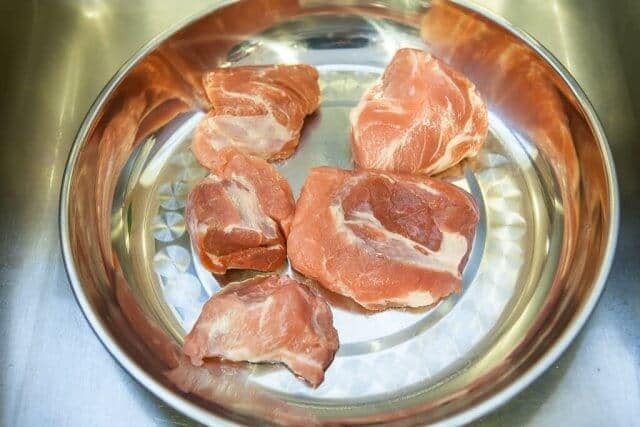 Place the pork in a shallow bowl. Pour just half of the boiling hot water on top of the pork. 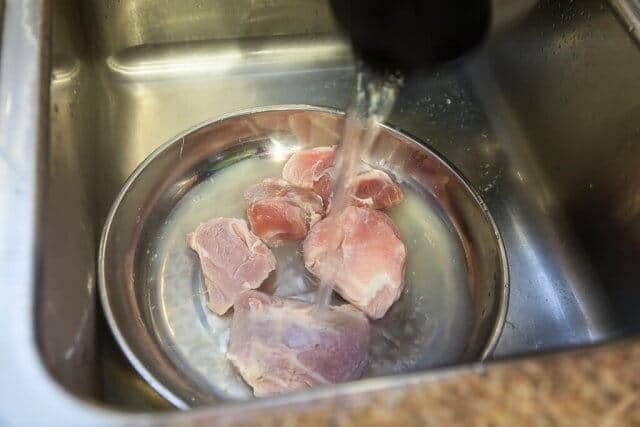 Give each piece of pork a jiggle in the boiling water. Turn the pork over. Drain and discard the cloudy water. Pour the remaining half of the boiling water on pork again. Give each piece a jiggle and wiggle and discard the cloudy, dirty water again. 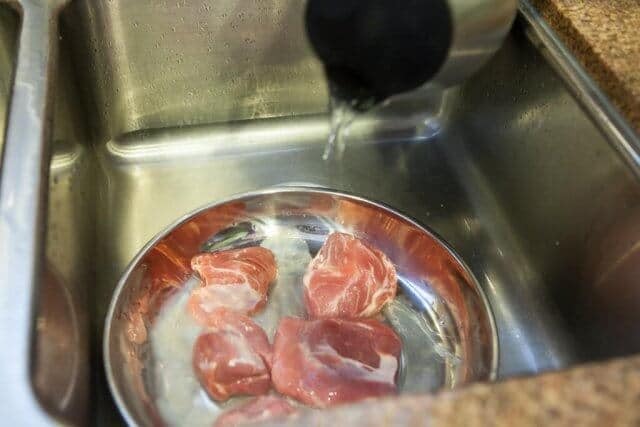 Final step: rinse the pork with cool water from the faucet. Now it’s clean, and ready for broth making. 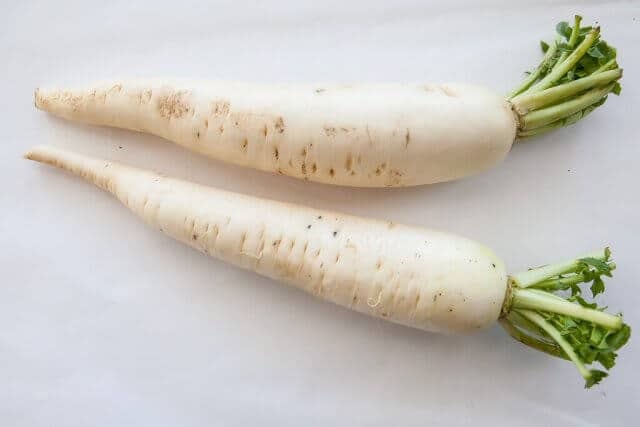 Daikon is white radish that’s mild and sweet in flavor when cooked, and delicate yet with a spicy kick when grated and eaten raw. In Asia, the daikon is used in so many ways: pickled, fried, simmered, stewed, grated, mashed and shredded. In Chinese cuisine, it’s most popular use is in soups, braised for hours with beef, or shredded to use in steamed and pan-fried daikon cake. You’ve probably eaten it raw at Japanese sushi restaurants (they serve it in a finely shredded mount along with sashimi), or julienned and pickled with carrots at a Vietnamese restaurant. They last quite a long time in the refrigerator. To store, I cut off as much green leaves as possible, wrap each daikon tightly in plastic wrap and store in crisper. They’ll last for at least one week. 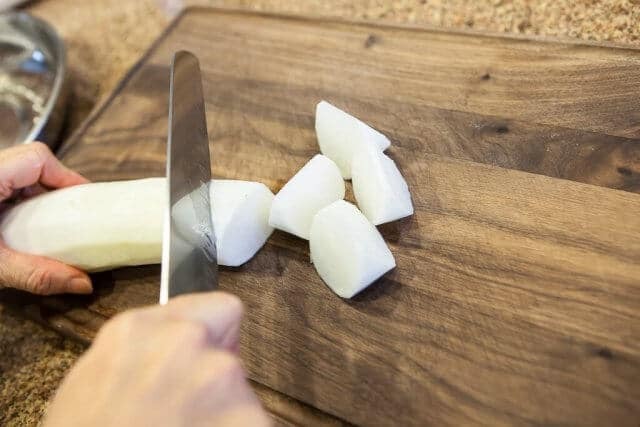 To use, peel with vegetable peeler first, trim and discard the tip and end. 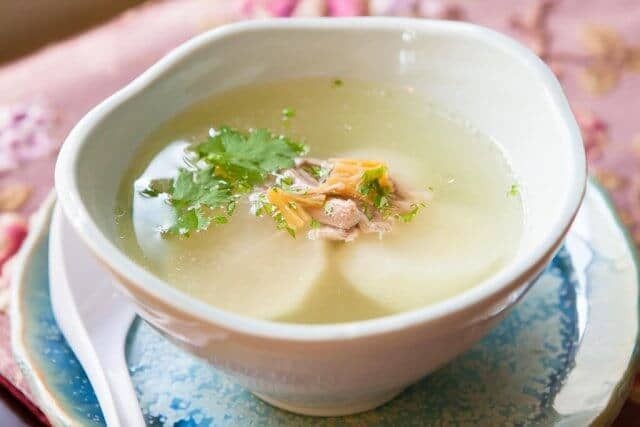 To prepare for this Chinese Daikon Soup recipe, you’ll cut the daikon into chunks. Or – just leave it out! We’ve made this soup plenty of times without the expensive dried scallops or other flavor boosters. 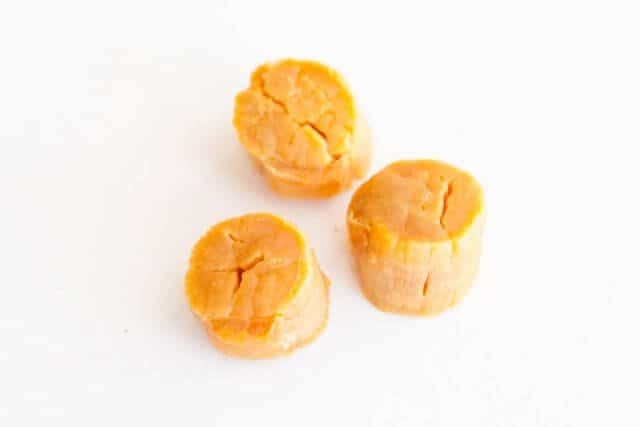 If you are using dried scallops for soup, you can just rinse the scallops (gets rid of any dust) and plop them into your pot for soup. If you are using the scallops in a stir fry, you must soak the dried scallops in hot water for about 15-30 minutes before using (depends on how big the scallops are.) You can then shred the scallops with your fingers. 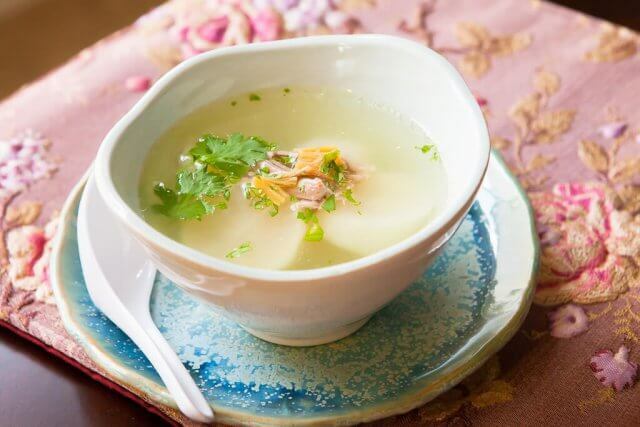 This Chinese Daikon Soup can be made in a pressure cooker, slow cooker or on the stove. Add all ingredients, fill with water and set to cook 20 minutes under pressure. 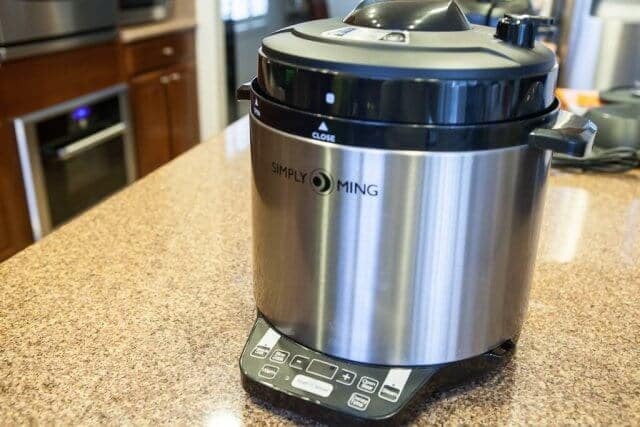 We’re testing out the Ming Tsai Pressure Cooker that HSN sells – it’s such a popular item that it’s been sold out since the day it appeared on-air with Ming Tsai! I’ll write a separate review of the pressure cooker another time. After cooking under pressure, you can wait for the pressure to release naturally, or you can manually release it. I like using a thick terry kitchen towel and tongs. After the soup is done, you can discard the pork meat, season with salt and serve with minced fresh cilantro if desired. Season with salt - start with 1 teaspoon, stir and taste. Garnish with cilantro, if desired.